Osama Bin Laden's lieutenant Ayman al-Zawahri has warned London will face more attacks because of Tony Blair's foreign policy decisions. His comments were made in a videotape which was broadcast on Arab satellite channel al-Jazeera. The al-Qaeda deputy said: "Blair has brought you destruction to the heart of London, and he will bring more destruction, God willing." Mr Blair denies his policies provoked the 7 July bombs, which killed 56. 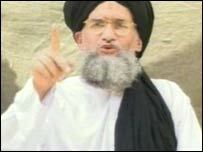 Al-Zawahri also warned the US that Iraq would be worse than Vietnam. Downing Street refused to comment on the latest al-Qaeda tape. Some critics, including MP George Galloway, said the war in Iraq had helped to spark the attacks on London. But Mr Blair has said the Iraq war is merely an excuse for those who want to attack the UK. He has acknowledged Iraq is being used to recruit terrorists, but insisted the roots of extremism were much deeper. In the tape al-Zawahri - who wore a white tunic with black turban and posed next to a rifle - also warned other nations to leave Muslim lands to avoid further violence. And he said: "What you have seen, O Americans, in New York and Washington and the losses you are having in Afghanistan and Iraq, in spite of all the media blackout, are only the losses of the initial clashes. "If you continue the same policy of aggression against Muslims, God willing, you will see the horror that will make you forget what you had seen in Vietnam." President Bush said al-Zawahri's comments would not prompt the US to withdraw from Iraq. "We will stay on the offense against these people. "They're terrorists and they're killers and they will kill innocent people... so they can impose their dark vision on the world," he said. Police are still investigating the bombings on Tube trains at Aldgate, Russell Square and Edgware Road, as well as a bus in Tavistock Square, and are also holding 15 people over the failed 21 July attacks. There is a massive police presence on London's streets, with 6,000 officers watching for a repeat of the attacks two and four weeks ago. A high-visibility police presence in the capital is aimed at making the public feel safe, while undercover officers are mingling with passengers on Tubes and buses trying to spot would-be bombers. Although police have received no intelligence about another attack, all leave has been cancelled and detectives drafted into uniform. Extra officers have also been brought in from outside the capital and retired officers persuaded to return to help with the anti-terror work. Thursday also saw the first person charged over the 21 July attacks appear in court. Ismael Abdurahman, 23, of Kennington, London, is charged with failing to disclose information about suspected Shepherd's Bush bomber Hussain Osman. He has been remanded in custody for a week. Al-Zawahri last appeared in a video in June, saying Muslims should not rely on peaceful protests but should also use violence. He also appeared in a video in February. Born in Egypt, he is thought to be Bin Laden's deputy and to have been hiding in the rugged border areas of either Pakistan or Afghanistan.